Treehugger has a post on the new Bahrain World Trade Center, which incorporates integrated wind turbines. Three wind turbine blades have been successfully installed on the Bahrain World Trade Center, a twin skyscraper complex. This is the first time that a commercial development has integrated large-scale wind turbines within its design to harness the power of the wind. The three massive turbines, measuring 29 meters in diameter, are supported by bridges spanning between the complex's two towers. Through its positioning and the unique aerodynamic design of the towers, the prevailing on-shore Gulf breeze is funneled into the path of the turbines, helping to create power generation efficiency. Once operational, the wind turbines will deliver approximately 11-15% of the energy needs of the building, or 1100 to 1300 megawatt-hours per year -- enough to provide light in 300 homes for over a year. Inhabitat had a post back on April 1 about London's Gherkin building turning green with envy because of all the attention the Bahrain buidling is getting. One commenter wisely pointed out its going to be difficult to mow. 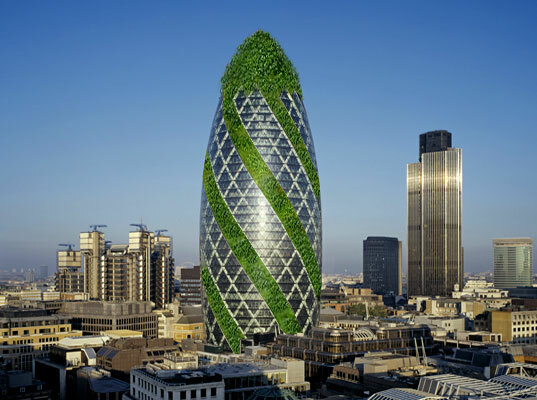 Under pressure from other more sustainable buildings popping up around the world, such as the recently featured Bahrain World trade Center, London’s Gherkin Tower, designed by Norman Foster, has recently begun testing an innovative vegetated facade panel which promises to change the face of building design forever. This new “Green wall” product, known as the Core Hydraulic Integrated Arboury Panel, promises to bring the benefits of green roofs to any exterior surface of skyscraper. The panel works by obtaining moisture through the air and funneling through its specialized membrane properties allowing it to provide for enough water to allow for plant growth. The plants, mostly a mixture of lichens and grasses are expected to grow out of the panel and envelope the facade. Needless to say the benefits of the panels are many: Shading, increased internal daylighting, thermal insulation, reduced water consumption, energy generation for the entire building, recycling of materials, reduction of toxicity in the interior spaces, acceptance of the Kyoto treaty by the countries which have yet to sign, world peace, and a rise in property rental income. On a different note (and date), Inhabitat has another post about a Norman Foster building, this time the new Kazakhstan Entertainment Centre, which, as one commenter noted, is VERY NICE ! Why stop at one stunning structure in Astana, Kazakhstan, when you can have two on your resume?! 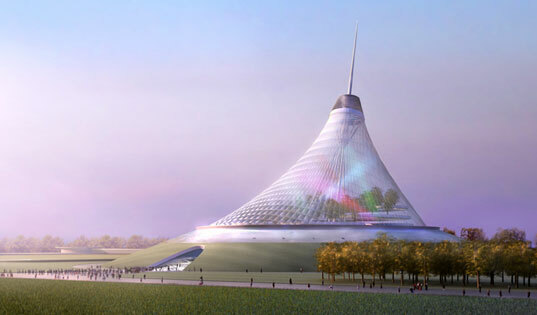 Sir Norman Foster is set to construct the new Khan Shatyry Entertainment Centre in Kazakhstan’s capital city after the completion of his geometric and eye-catching Palace of Peace and Reconciliation proved to be such a success in its form AND function. The new structure will sit at the northern end of the new city axis and stand as the highest peak on the skyline at a majestic 200 meters tall. The entertainment centre will house 100,000 square feet of public park, retail, and entertainment space. Foster has a track record of thoughtful, sustainable building, and Khan Shatyry is no exception, providing both aesthetic focal point and environmentally-sensitive spatial solution. Developed as a response to harsh weather conditions in both winter and summer, Khan Shatyry is held up by a central mast and clad in ETFE, which allows for a wash of light for interior spaces while sheltering inhabitants from the heat or cold. ETFE is, coincidentally, the material-du-jour we’ve seen being used in everything from PTW’s Beijing Bubble Building to Herzog and DeMeuron’s Olympic Stadium. The centre will also include an interior park, undulating terraces, a river, wave pool, and waterfall, all lit by a high-tech roof lighting system seamlessly integrated into the structure. Other public spaces include cafes, restaurants, and movie theatres. The pinnacle of the building, literally and metaphorically, will no doubt be its viewing deck terrace, offering dramatic views of the park and city. One more from Inhabitat - this one on some micro wind turbines - for harnessing some of that free energy washing over every building. Conventional wind turbine technology has been a bit out of reach for most residential consumers living in urban areas—until now. Researchers at Hong Kong University and Lucien Gambarota of Motorwave Ltd. have developed Motorwind, a micro-wind turbine technology small enough for private use in both rural and urban environments. Unlike large-scale wind turbines, Motorwave’s micro-wind turbines are light, compact (25 cm rotor diameter), and can generate power with wind speeds as low as 2 meters/second. The gear-like turbines can be linked to fit just about anywhere and a row of eight turbines costs just $150 for now (prices may decrease once the turbines are mass produced). A portion of the revenue raised from the sale of Motorwind turbines (available for purchase here) will be donated to Hong Kong University to continue researching renewable energy technology. According to tests, turbines arranged within a surface area of one square meter and a wind speed of 5 m/sec generate 131 kWh/yr. We’ll be watching when the Hong Kong Sea School installs 360 micro-turbins (20 square meters) next month. A second installation of another 880 micro-turbines will be realized if the first installation is a success. Plans are also on the way for the World Wildlife Fund’s Hoi Ha Marine Reserve to install micro-turbines some time in the near future. A new report from the UN (pdf) points out that constructing energy efficient buildings is the most effective way of mitigating global warming. Better architecture and energy savings in buildings could do more to fight global warming than all curbs on greenhouse gases agreed under the UN’s Kyoto Protocol, a UN study showed on Thursday. Better use of concrete, metals and timber in construction and less use of energy for everything from air conditioners to lighting in homes and offices could save billions of dollars in a sector accounting for 30-40% of world energy use. “Buildings can play a key role in combating climate change,” the UN Environment Programme (UNEP) said in a report issued in Oslo during a conference on ways to promote economic growth without damaging the environment. Simple measures include more blinds to keep out the sun in hot climates, switching to energy efficient lightbulbs, better insulation and ventilation. “Avoid building a bigger house than you need,” was among the tips. “By some conservative estimates, the building sector worldwide could deliver emission reductions of 1.8 billion tonnes of carbon dioxide,” said Achim Steiner, the head of UNEP. Carbon dioxide is the main greenhouse gas. “A more aggressive energy efficiency policy might deliver over two billion tonnes or close to three times the amount scheduled to be reduced under the Kyoto Protocol,” he said. Achim Steiner, UN Under-Secretary General and UNEP Executive Director, said: " Energy efficiency, along with cleaner and renewable forms of energy generation, is one of the pillars upon which a de-carbonized world will stand or fall. The savings that can be made right now are potentially huge and the costs to implement them relatively low if sufficient numbers of governments, industries, businesses and consumers act". BLDG BLOG notes that Arcinect, Inhabitat and themselves all featured in the Wall Street Journal recently (must have been taking another break from their global warming denial pogrom). Jill Fehrenbacher, a graduate student at Columbia University's architecture program, created her group blog in 2005 to explore what seemed to be an untapped topic: sustainable architecture, which focuses on using recycled materials and otherwise protecting the environment. "I wanted to read something that had that focus, and couldn't find anything out there," Ms. Fehrenbacher says. "There are publications dedicated to design, and policy issues, but nothing about the overlap between the two." Recent posts cover a "disposable chandelier" made of plastic wine glasses, and the designs for towers in a park that are meant to be covered with vines. Paul Petrunia, a Web producer who helps architects develop sites for their projects, founded the Archinect school (!) as a resource for aspiring architecture students. The close-knit nature of the industry, he says, presents a challenge for people who want to know which programs are the best and which skills they should develop. So the school blogs help them out. Prospective students can thus "browse the blogs – which are indexed by region and school – to get an inside look at programs that interest them." 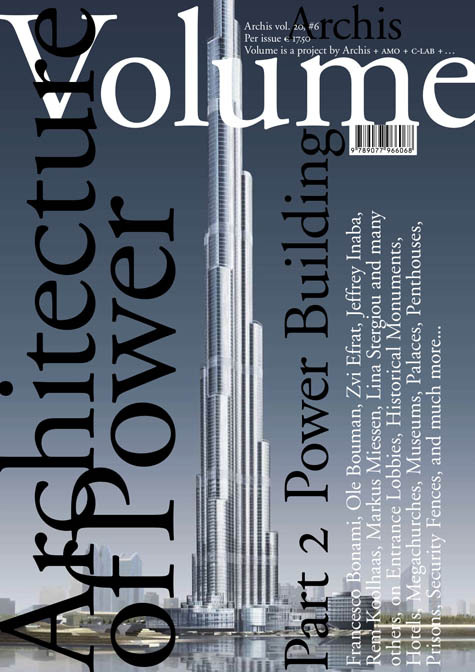 Geoff Manaugh says that there are architecture writers who are primarily concerned with buildings and others who are interested in anything architectural. His blog is definitely an example of the latter. Recent posts have covered a photograph of a "cosmic volcano" associated with star formation, a shantytown built on a frozen lake in Minnesota and the recent purchase on eBay of the window through which John F. Kennedy was assassinated. The Dow briefly rose upon the findings... In any case, I was happy to see the coverage. So much of what we hear about the state of the envionment is doom & gloom, with predictions of global catastrophe and visions of a dark, overpopulated and hot future. It’s definitely important to heed the warnings about what’s happening to the planet, however focusing only on the negative will result in us feeling as though the situation is hopeless; it’s not. Here are a few of the books that have really inspired me, and made me believe that a bright, green, sustainable high-tech future really is possible. ... John Todd, a Canadian scientist probably best known for his work with sewage-treating ‘Living Machines’, paints a very compelling picture of a sustainable future in the book "From Eco-cities to Living Machines". Dr. Todd’s work also mimics nature, using constructed ecosystems inside large tanks to carry out processes such as treating wastewater and cultivating fish. When I first read this book years ago it introduced many concepts to me such as urban farming, biological waste treatment, and perhaps the most fascinating to me: aquaponics, which involves purifying fish tank water with plants which are able to derive nutrients from the wastes. This would allow both vegetable and crop production, anywhere, without the problems associated with conventional fish farming or the nutrient and fertilizer costs associated with conventional hydroponics. Natural Capitalism is a book that I initially passed over, as I’m more interested in technology than economics. However, I’m glad I did buy this book because it introduced me to the concept of a service-based economy; an idea that meshes very well with the things I learned from the previous 3 books. In a nutshell, rather than buying a refrigerator or a computer, you would lease the service or functionality provided by this device. For a refrigerator this would be the service of keeping your food cold. This would include not just the physical device, but also any associated costs including electricity. The provider company would be responsible for delivering, installing, maintaining, powering, and ultimately recycling the device, something that would very quickly ensure efficient and easily recyclable products. Finally, Engines of Creation deals with the subject of nanotechnology. Although there have been many worries about the dangers of nanotechnology, some very valid, I do believe that nanotechnology holds tremendous promise for transforming our society into a very efficient and high tech one. Already nanotechnology is improving batteries and capacitors, improving the efficiency of solar cells, creating more efficient ways to collect and purify water, and many more amazing things. In the future nanomachines will also be able to assemble and disassemble products at a molecular scale, which would eliminate the need for most factories and their related energy consumption. This is just barely scratching the surface of what nanotechnology can do for the environment, there are many more exciting things awaiting us in the future. The future can indeed be green as well as high-tech, these are a few of the books that show us how. Blaine Brownell has a post on a technique for increasing the energy efficiency of air conditioners up at TransMaterial. Now that energy consciousness is becoming increasingly widespread, one cannot fail to notice common practices that call for more energy-efficient solutions. One of these practices involves refrigeration within cold climates: a process that involves cooling goods within a heated space, which is highly impractical considering the amount of time that 'free cooling' exists outside. The Freeaire Refrigeration System is designed to provide such free cooling for walk-in coolers, freezers and cold storage warehouses. The system utilizes an electronic controller to finely tune the operation of standard refrigeration equipment, and this controller simply monitors the outdoor temperature and desired temperature settings and stops refrigerator evaporator fans when not needed, which also reduces the compressor's refrigeration load. Proper airflow is maintained when the evaporator fans switch off by operating one or more energy-efficient circulating fans. Roughly half the electricity consumed by a typical convenience store is used for refrigeration. The Freeaire System is designed to save energy year-round by allowing refrigeration equipment for a walk-in cooler or freezer to run only as much as it has to. Once the system is installed, evaporator fans typically operate 50 to 75% less often, and reach-in door heaters operate 90% less frequently. Condensing units also usually experience a 10 to 20% reduction in operations. Moreover, a Freeaire System saving 20,000 kilowatt-hours annually can prevent 40,000 pounds of CO2 from being emitted to the atmosphere. The Independent has an article on Britain's first custom-built green housing estate. Britain's first entirely green housing estate, complete with wind turbines and rainwater harvesting facilities, is to be built in London's Docklands. Residents in the zero-carbon development will be able to grow their own food in community greenhouses, power their televisions with tree branches and compost their rubbish in sophisticated waste segregation facilities. The estate, to be built on wasteland in the Royal Docks, in east London, will be powered by solar panels and wind turbines. Rainwater will be recycled to flush loos and water plants, and branches collected by tree surgeons around London will be delivered each month to heat and power the building. The housing development, subsidised by Ken Livingstone's London Development Agency, will provide flats with their own allotments and roof terraces for growing vegetables. A cycle club and a car pool will operate to reduce carbon emissions. The flats will be constructed from sustainable wood, locally produced gravel and reclaimed concrete. Work will begin next month. Half of the completed homes will be reserved for social housing while the other half will be sold at commercial rates. A spokesman for the London Development Agency, which owns the land, said: "Traditionally the environment has been a middle-class concern. But the environment is as important for working-class families as for everyone else." Tony Juniper, director of Friends of the Earth, said:"If we can demonstrate that these things can be done, we can inspire people to believe that averting global warming is not only possible but better for our standard of living." Last evening we discussed building preservation and re-use with Catherine Nasmith, one of Toronto's leading preservationists, publisher of Built Heritage News and former chair of the Toronto Preservation board. She noted how important it is to save older buildings as part of the texture of our cities, and also how much more resource-efficient it is to renovate rather than replace. However there is often concern that one cannot make an old building as energy-efficient and green as a new one. Coincidentally, this morning we learn of a project in the UK where a huge1911 woolen mill, built the same year as the launch of the Titanic is being converted into condos, and that the building well be completely carbon free. "All Titanic Mill’s heat and a high proportion of its electricity will come from a Combined Heat and Power unit, or CHP. This will be fuelled using various species of tree cuttings, chipped to create a biomass fuel. The sustainably-managed trees undergo a regular period of growth each year, allowing wood to be harvested in a continual cycle. During the growth process the trees extract CO2 from the atmosphere in sufficient volumes to balance the CO2 which is released when wood is used as fuel." It also has 400 KW square metres of photovoltaics and rainwater harvesting. Unfortunately this mill appears to be in the middle of nowhere near the town of Huddersfield, and the site plan shows it surrounded by a sea of parking, so while the building may be carbon neutral its residents probably won't be. Over a thousand of them were built in the sixties and seventies: monstrous twenty-five storey slab apartment buildings. And where TreeHugger usually says that high-density living is the most energy efficient, (and on a per-capita basis it probably is) these buildings are huge energy hogs, each building contributing more than a thousand tons of carbon dioxide per year. They have minimal insulation, exposed slab edges and balconies, single glazing and primitive heating. Welcome to Moscow on the Humber. There is a bright side: two University of Toronto Architecture profs have studied the buildings and figured out that they may be the most cost-effective ways to reduce CO2 emissions in the City. (see some of their ideas below the fold) This has happened all over Europe and the former Soviet states; Tower block restoration is Bratislava, Slovakia's single largest environmental initiative. Unfortunately in Toronto these buildings are all in private hands, and no government in an election cycle is going to give its green subsidies to rich urban landowners. The Rebuilding Center, a non-profit run by volunteers in Portland, Oregon, takes what is considered waste by some and gives it a second life. "[It] opened to the public in 1998 and moved to a 24,000 square foot warehouse in 1999. By 2001, five tons of materials were being kept out of the landfill each day! In 2005 The ReBuilding Center completed its expansion project, adding 40,000 square feet of developed property and the potential to divert nearly ten tons of construction and demolition waste per day by 2008." Now that we can do anything, what will we do ? In his Nobel Prize acceptance speech on December 11, 1957, former Prime Minister of Canada Lester B pearson quoted historian Arnold Toynbee, well known for his monumental "A Study of History". The main thesis of Toynbee's work is that the well being of a civilisation depends on its ability to respond creatively to challenges, human and environmental. He was optimistic about the twentieth century. He believed the cycle of rise and decline was not inevitable, that the future is not determined by the past, and that a civilisation could choose and act wisely in the face of recurring hardships. His prediction posed a challenge - and an opportunity - during the post WWII era; it was significant enough for pearson to reference it in the context of inetrnational peacekeeping during the cold war era; and it continues to challenge us today, into the twenty first century. Our world now faces profound challenges, many brought on by innovation itself. Although optimism runs counter to the mood of the times, there are extraordinary new forces aligning around these great challenges, around the world. Between 1965 and 1975, R. Buckminster Fuller conducted five two-year "advanced design science" intensives and pulled together the results of the participants' research and analysis into several volumes of what he called the World resources Inventory. In Phase 1 of the work "Inventory of World Resources Human Trends and Needs" he wrote, "There are very few men today who are disciplined to comprehend the totally integrating significance of the 99 percent invisible activity which is coalescing to reshape our future. there are approximately no warnings being given to society regarding the great changes ahead. There is only the ominous general apprehensionthat man may be about to annihilate himself. To the few who are disciplined to deal with the invisibly integrating trends it is increasingly readable in the trends that man is about to become almost 100 percent succesful as an occupant of the universe". this book is dedicated to all those with the discipline to comprehend the totally integrating significance of the 99 percent invisible activity which is coalescing to reshape our future. This is the beginning. The urban economies section itself focusses on manufactured housing (large efficiency gains are possible with prefab housing vs houses built on site), urban density (the "cities are the future" concept) and sustainable architecture featuring an interview with Michael McDonough. 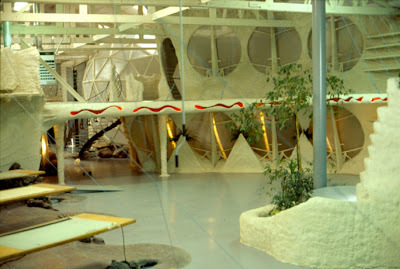 It also has a nifty picture of Bucky Fuller's Dymaxion House from back in the 1920's. Jennifer Leonard: Your e-House is a unique mix of high performance and alternative technologies. What was your inspiration? Michael McDonough: I was prompted by an article I did with Bruce Sterling for Wired called "Newer New York," which became a focal point for learning about and consolidating information on all the building products in existence. Much to my surprise, every single thing I could think of – if I Googled around enough – I found. And more often than not, I discovered that I could buy it with a credit card and have it shipped overnight to a building site. I quite literally found the future of building on the Internet, waiting to be purchased and implemented. This notion became the basis for a science fiction story, but then I started thinking about building it for real. My wife and I were looking at property in upstate New York at the time, so we decided to go for it. JL: How is e-House a metaphor for the community? MM: Buildings should not be considered as isolated objects. It’s profoundly important to understand how they’re connected to the ground and the sky, and how they’re connected to the culture of an area. In terms of technological connections, or connections to the culture of technology, this means making a building that thinks for itself, analogous to the way a human body functions. I’d like the building to adjust itself according to temperature and send email alerts when it needs attention. JL: How is holistic thinking important to architecture? MM: Every building has connections to the sky, ground, and community, but these could be appreciated and utilized much better. In e-House, we collect rainwater to irrigate our garden. We also use it to store energy from sunlight and earth, and that energy is used to heat or cool a hyper-energy-efficient house. If you extend this thinking to other building systems, you can engineer a geothermal field for maximum efficiency by backfilling it with clean, well-drained, fertile soil, and get both a heating and cooling source for your home and a productive organic garden. The more people start doing this community-wide, the more open space and forest can be conserved. This, of course, is an alternative to suburban sprawl. If government encourages this tendency through tax policy, you get large organic districts with hyper-energy-efficient homes. I want to encourage in architecture and, in turn, in public policy and regional planning. JL: How are megacities impacting the environment? MM: There’s nothing to say that cities are in and of themselves bad. You can do green buildings, you can do green infrastructure systems, and you can reduce vehicular transport by using mass transportation. You can consolidate building construction and heating and cooling systems in larger structures – not that you should do megastructures, necessarily, but there are efficiencies of scale. The surprise is that New York City is one of the most environmentally efficient cities on the surface of the planet because of its density. So density is not necessarily the enemy. It seems that suburban sprawl is the enemy; this is where you need to have more profound innovation. My suggestion is that you stop thinking about the city and the suburbs and the exurbs and the rural areas as separate entities and you really consider them as united ecosystems. 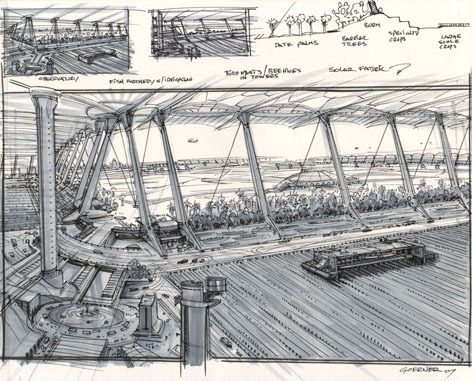 JL: From a design perspective, are there exemplary building materials for dense environments? MM: I like bamboo a lot. The more you use it, the better things get. It’s deeply versed in cultures all over the world, it’s stronger than steel in tension, it’s stronger than concrete in compression, and it’s more stable than red oak, which is a very stable flooring. When you plant it, it acts as a bioabsorber, cleaning pollutants out of the soil; it simultaneously stabilizes the soil and prevents erosion. While it’s doing all of these good things, it returns more oxygen to the air through photosynthesis than almost any other deciduous plant. JL: It’s clear, then, we need to plant more bamboo around the world! MM: If we did that, it could have a profound effect on carbon sequestration, which means it could sequester carbon out of the atmosphere and deal with global warming related to the problem of greenhouse gases. JL: Do you think architecture can link up with other disciplines, like manufacturing, to start addressing the global housing crisis? MM: Architects continue to attempt universal solutions. The problem is, we don’t have a universal climate. And you really need to adjust your building types to climate. What makes sense in southern California may not make sense in northern Canada, for example. But there are useful manufactured components of buildings, such as structural insulated panels that have high insulative value. You can have a design produced on a computer and email it to one of the manufacturers, and they will cut out the doors and windows and number the panels and put it together like some sort of fanciful Lego system. This allows for a distributed manufacturing system that can be adjusted regionally. At the same time, you can have almost infinite design flexibility, which is a problem, for example, with modular houses. JL: What does it mean today for designers to think globally? MM: Well, I think whenever you sit down at the drafting board or the computer, whatever your media might be, it’s important to ask yourself what the implications of a project are, beyond the object itself – whether the object is a building or a chair or a table. To constantly ask, "What are the processes by which this thing is produced?" and "What are the processes by which it will end its useful life?" Beyond that, I like the idea of multitier thinking. It’s always good to investigate the possibility of making any one system do multiple things. As I mentioned with the e-House, if you’re going to spend a lot of time and energy engineering one of its systems, shouldn’t you also ask yourself what else that one system could do? Massive Change also includes a section on Energy Economies (its worth checking out the book or exhibition to see all 11 economies that are analysed). We continue to design massive hydroelectric and petroleum projects with regional and even global economic, social, and environmental impact, building machines on a scale the world has never seen. At the same time, initiatives for sustainable energy wind, geothermal, and especially solar promise to fundamentally restructure the energy system itself, from a centrally based system to a distributed network of energy production and consumption. The big projects: In the realm of energy, we are seeking out small, portable options for our decentralized future. Meanwhile, we persist in designing feats of wonder that will fundamentally reconstruct the natural world. Clean green power: Initiatives for sustainable energy promise to fundamentally restructure the energy industry itself. To stay in the game, the oil industry is evolving away from fossil fuels, towards renewables. The most massive change will happen here. In the 1960s, the late geophysicist Dr. M. King Hubbert famously foretold the end of American oil production. Based on his research, he came to the conclusion that oil production would peak within a year or two of 1970. He was widely abused for this notion. But it turns out, in fact, that he was right. Current projections indicate that global oil production, too, ought to peak well before our population stabilizes somewhere around mid-twenty-first century, with fertility rates dropping as they are. Natural gas and nuclear are the current forerunners to replace oil. But, in close analysis, neither proves adequate. Natural gas will not be able to meet the world’s energy demand much beyond 2020, and a future of nuclear breeder reactors isn’t exactly an attractive scenario. So major players like Shell, British Petroleum, and Stuart Energy have been working toward alternatives to oil: wind, solar, and hydrogen fuel by way of water electrolysis. Among numerous renewable initiatives, Shell is developing Noordzeewind, a wind park off the coast of Wales, which will consist of 36 turbines (99 megawatts total) and provide electricity for 110,000 households. British Petroleum’s Hornchurch Connect site (near London) runs entirely on renewable energy, generating up to half of its own power from solar panels and wind turbines. Stuart Energy builds hydrogen fueling stations around the world, enabling the production, storage, and delivery of on-site emission-free fuel. Solar power: All energy is solar energy, stored in different forms. Every two minutes the sun gives the earth more energy than is used annually worldwide. It is the only renewable resource with the capacity to provide all the energy we need on a global level. English-born American physicist and mathematician Freeman Dyson pointed out in his book The Sun, The Genome, and the Internet that solar energy is most abundant where it’s needed most: in the countryside rather than in cities, and in the tropical countries, where most of the population lives, rather than in temperate zones. On the global scale, the Solar Electric Light Fund (SELF) provides technical and financial assistance for solar energy and wireless communication systems in the developing world. SELF has launched what it calls solar rural electrification programs and enterprises in all corners of the globe. These programs have brought photovoltaic systems and often electricity for the very first time to remote areas of China, India, Sri Lanka, Nepal, Vietnam, Indonesia, Brazil, Tanzania, Uganda, South Africa, and the Solomon Islands. On the atomic scale, the Arizona State University (ASU) Center for the Study of Early Events in Photosynthesis researches ways of capturing light and transforming energy. The center is comprised of a multidisciplinary group of scientists, one of whom is synthetic organic chemist Ana Moore, who looks to purple bacteria which can harness the sun’s energy through photosynthesis to better understand these processes and how we might use them as a model for developing improved solar panels one day. The results of this research illustrate the advantages of designing functional nanoscale devices based on biological paradigms. The single biggest mistake that has been made in the attempt to sell the Green Agenda was to frame it as a high-minded, pleasure and ego denying act of parsimonious sacrifice. Abundance and stewardship are not antithetical propositions. Eden was not spartan. I realize that many well-intended persons will be shocked by this notion, but despite the looming environmental, political, social and economic catastrophe, the solutions to this great crisis are at hand and they look great. The one departure I'm going to make from Bruce's vision is where he describes this glamorous direction as "unnatural," although this may only be a bit of a semantic difference, as one could interpret his intention as man-made, which this effort will certainly be. But enough talk aleady--let's have a look at fashionable salvation. As more than one visionary has been to heard to remark, world-changing begins in the home. Not to bludgeon our audience with statistics, but did you know that nearly half the world's greenhouse gas emissions are the result of our, well, horrible architecture? Not that it's the architects' fault, exactly, what with the weight of tradition and the inertia of design, etc. We do not advocate the lynching or burning in effigy of any practicing architects: some of them have even owned up to this miserable state of affairs. Others are at the forefront of the new wave of glamorous green design. Let's take a look at what they've come up with. One truly renaissance kind-of-guy, Eugene Tsui, has founded a school of design that uses nature as a starting point, but then takes his creation on an absolutely stellar trajectory. How's this for a modest little self-starter? This structure is based upon the world's most indestructable living creature--the Tardigrade, with its oval plan and parabolic top it utilizes the same structural principles nature employs in creating an astoundingly durable design. Internationally touted as the world's safest house, it features an oval reinforced concrete foundation over a series of large perforated drain pipes that immediately dispel any water built up and heaving from the soil or sudden flood conditions. The house has proven itself to be cool in the hot summer months and warm in the cold winter months, all without mechanical air conditioning and heating machinery. There was one interesting sort of warning about this house, under the heading "Ecological Requirements": None. The owners were gradually educated about the benefits and advantages of a nature-based, ecological approach to designing their home. They grew to support this ecological attitude especially if it meant a cost savings and a simper way of maintaining the home. You see? No preaching, no hairshirt. 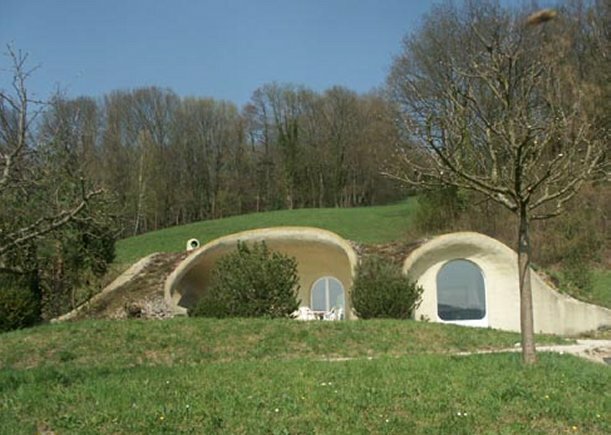 Just fun in the sun in an indestructible, zero-emission, life-friendly house. 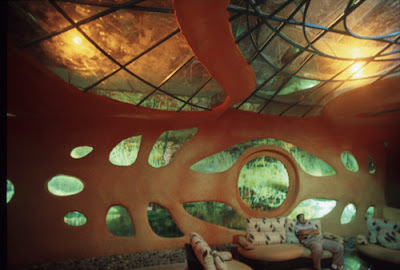 Before we leave Mr. Tsui, let's try to remember that the guy designs everything, not just groovy, planet-saving houses. Unusual building designs are appearing in a number of other places - WorldChanging has a post on BP's Helios House. I've always loved the old Steve Martin film, LA Story, for the way it made the absolute reality of Los Angeles seem fantastical and surreal simply by focusing hard on the small, specific quirks of daily life there. It's only fitting, then, that BP chose this city as the first location for their new gas station model -- a green and rather glamorous geometrical structure that shares no resemblance with the standard variety. One would call it futuristic, except, as BP itself says, this is "not a prototype 'station of the future.' It’s a station for today," and it's up and running on the corner of Robertson and Olympic. * A rooftop solar array on the roof that supposedly generates enough power to light 2-3 average US homes and "eliminates 15 to 23 tons of CO2 from the atmosphere each year." Second, TreeHugger looks at Transformation House by Michael Jantzen. 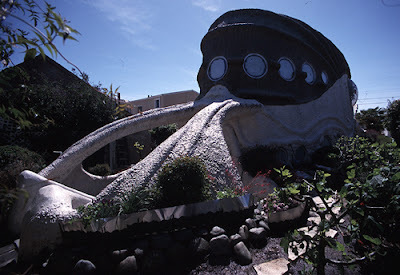 Back to the Cuttlefish, he has also been proselytising (way down in the comments on March 28) on behalf of n'Kozi Homes, an interesting outfit in South Africa using Bucky Fuller's ideas to build affordable green housing. Our philosophy is an evolving discourse between people and their environment, technology, structures, space, and the meaning thereof. If Architecture is the building of a cultural ideal, then the poetic integration of technology into real spaces, for real people is an appropriate goal for our times. We address each aspect as a critical exercise in which our understanding of architecture and urbanism may be extended, or revised altogether. We cannot solve 20th century problems with 20th century thinking, we need new and innovative approaches that clearly distinguish between providing solutions or contributing to problems. Almost all evidence points to the fact that any community with sub-standard housing is also a community with poor health, a high incidence of infectious diseases, high crime rate, low family stability and low moral standards. Under such conditions, attempts at improving health, education and social responsibility are destined to fail. The reverse is also true insofar that an improvement in housing conditions leads to a spontaneous attempt at improving living conditions with quite a pronounced "knock-on" effect. We all realise that it is no longer feasible to waste precious fresh water for sewage and we need to develop without waterborne sewage by using waterless toilets that saves fresh water and costly infrastructure. 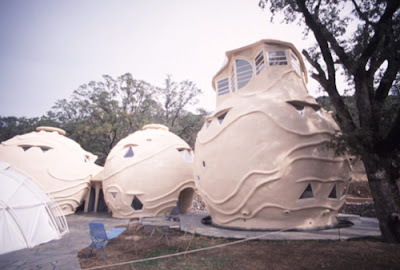 In a Nutshell - n'Kozi Homes is the brainchild of inventor, provisional patent holder and eco-preneur, Joseph Feigelson. n'Kozi therefore has propriety technology that provides an integrated solution for the number one demand product in Africa, namely energy efficient housing. In short, the technology and system uses conventional SABS and Agrément approved building materials and solar innovations. This allows for the provision of comfortable and more than adequate shelter for a multitude of uses. The product provides more volume over a larger surface area using less material than any other system while using fewer materials and providing the strongest structure known to man. A minimally trained crew of 5 people can produce a turnkey 33 square meter structure including a passive solar hot water system and solar electricity that give free warm water and free electricity for life within a few days. To see the awesome flash demo, start here, under Concept. For further explanations of how we're going to sink the hydrocarbon economy, strip the elite of their transgenerational privilege, dismantle the Corporate/National Security State...stay tuned. The Cuttlefish has a whole lot more on sustainable architecture here which I recommend checking out (too much text and too many images for me to try and trim down to fit within this blog post I'm afraid. the only line which does not intuit man as the image of God." As the CA Boom extravaganza approaches, we thought we would look at who is in the Prefab Zone. First up is our beloved Marmol Radziner Prefab. They burst onto the scene at Dwell Magazine's Prefab Now fifteen months ago with their stunning desert house, still perhaps the most beautiful prefab on this continent. Now we can see the Utah house shown above, renderings for 13 custom prefabs in the works, a subdivision in Joshua Tree and who knows how many standard models. What a track record in such a short time. Marmol Radziner is unusual among architects in that it had a factory to do millwork and detailing, so it was a natural step to expand to do complete buildings. Green aspects of their buildings: use of responsible woods, SIPs, solar panels, natural cooling and recycled steel construction, and of course, efficient factory built construction. The Cuttlefish mentioned New Orleans as a place where affordable green housing is needed - TomDispatch had an article recently from Rebecca Solnit on Not Forgetting New Orleans. So Halliburton is leaving the neighborhood. If I were you, I'd start selling. It's a sign that property values are heading down in looted and Katrina-tized America. With full protestations that it really isn't going anywhere, Halliburton, with its $19 billion in Pentagon contracts, with its $2.7 billion in estimated Iraq overcharges, is moving its headquarters to Dubai, the Las Vegas of the Middle East where almost anyone is welcome to plot almost anything on the indoor ski slopes or private mini-islands. If I were the head of Halliburton, I'd be heading for Dubai, too, or at least for parts unknown while the Bush administration is still in office and I still had a roof over my head. Enron's Ken Lay could have taken a tip or two from Halliburton Chief Executive David Lesar on the subject. Far too late now, of course. And I wonder whether Al Neffgen, the ex-Halliburton exec running the privatized company, IAP Worldwide Services, that was put in charge of Walter Reed Army Medical Center in 2006 as part of the privatization of the military, might be considering a holiday there as well. No mold, no rats (other than the human kind), just honest sun and sand, surf and turf, oil money and… well, everything that goes with it. I've long been interested in ruins, in cities and civil society in the wake of disaster, and so I've been to New Orleans twice since Katrina hit and I've tried to follow its post-catastrophe course from afar the rest of the time. On this carnival-season visit, even my own response was contrary: I wanted to move there and yet was appalled, even horrified, by tales of institutional violence that people passed on to me as the unremarkable lore of everyday life. If New Orleans is coming back, it's because a lot of its citizens love it passionately, from the affluent uptowners who formed Women of the Storm to massage funding channels to the radical groups such as the People's Hurricane Relief Fund dealing with the most devastated zones. Nationally, there have been many stories about people giving up and leaving again because the reopened schools are still lousy and crime is soaring; the way people are trickling back in has been far less covered. The city's major paper, the Times-Picayune, recently revealed that the maps people have been using to represent the amount of wetlands buffer south of the city are 75 years out of date and there are only 10 years left to save anything of this crucially protective marsh-scape, which erodes at the rate of 32 football fields a day. That doesn't mean people aren't trying all over the city. It's easier, however, to get out the power tools than to untangle the red tape surrounding all the programs that are supposed to fund rebuilding or get governmental agencies at any level to act like they care or are capable of accomplishing a thing. "Are you trying to rebuild?" I asked the woman who'd come into NENA, the Lower Ninth Ward Neighborhood Empowerment Network Association in the part of New Orleans most soaked by the floods Katrina caused. She politely but firmly corrected me, "I am going to rebuild." I ran into this kind of steely will all through my eight days exploring the city. NENA's office in a small stucco church building in the heart of the Lower Ninth, the neighborhood of black homeowners that sustained several feet of water for weeks after the storm, is full of maps and charts. The most remarkable is a map of the neighborhood itself with every home being rebuilt marked with a green pushpin. They are lightly scattered over the map, but there are green dots on nearly every block and clusters of them in places, about 150 in this small neighborhood that looked as dead as anyplace imaginable not so very long ago. When I visited the Lower Ninth six months after Katrina, the gaping hole where a barge had disastrously bashed through the levee above the Industrial Canal was still there, as were the cars that had been tossed like toys through the neighborhood when the water rushed in so violently that it tore houses into splinters and shoved them from their foundations. The Lower Ninth was a spooky place -- with no services, no streetlights, no inhabitants. The returnees, Jackson told me, are mostly doing their own rebuilding -- but sheet-rocking and plumbing are far easier to master than the intricate bureaucracies applicants must fight their way through to get the funds that are supposed to be available to them. Even those who are not among New Orleans' large population of functional illiterates, or whose lack of electricity and money means that sending off the sequences of faxes required to set things in motion is arduous, or who lack the phones and money to make the endless long-distance calls to faceless strangers shuffling or losing their information have problems getting anything done -- other than by themselves. The Washington Post has an article on some affordable (but very non green) housing intended for New Orleans which never quite got there. Stored in such places as the vacant land near an airfield in Hope, Ark., an industrial park in Cumberland, Md., and a warehouse in Edison, N.J., are the results of one of the federal government's costliest stumbles in the aftermath of Hurricane Katrina -- tens of thousands of empty trailers. The Federal Emergency Management Agency hurriedly bought 145,000 trailers and mobile homes just before and after Katrina hit, spending $2.7 billion largely through no-bid contracts. Now, it is selling off as many as 41,000 of the homes, netting, so far, about 40 cents on each dollar spent by taxpayers. Thousands more of the homes -- critics say more than 8,000 -- have never been used and cannot be sold immediately, even though scores of people in the South have been made homeless by recent storms. "While FEMA has 8,420 brand new, fully furnished, never-used mobile homes in a cow pasture in Hope, Arkansas, they refuse to provide the people from Desha, Back Gate and Dumas counties with help. This is crazy," said Rep. Mike Ross (D-Ark.). "If this is the new and improved FEMA, I don't want any part of it." FEMA cannot sell unused mobile homes directly to the public because of legislation passed by Congress in October at the industry's urging. Instead, the agency must now go through a time-consuming process of trying to donate them first to federal, state and local agencies and public service groups, according to the Manufactured Housing Institute's Web site. But FEMA has refused Ross's request to release 150 mobile homes to shelter people in his state who were displaced on Feb. 24 by two tornadoes, because President Bush has not declared the counties a federal disaster area, precluding FEMA's involvement. Still, the number of homes the agency can sell has industry groups worried about a market glut. FEMA's potential for-sale inventory is nearly equivalent to 30 percent of the recreational-vehicle industry's U.S. sales in 2006. "As you can imagine, a public auction of so many vehicles could devastate the market for travel trailers," Michael A. Molino, president of the 2,700-member Recreational Vehicle Dealers Association, said in a letter Friday to FEMA Director R. David Paulison. Molino's group and the National Association of RV Parks & Campgrounds asked last week that the trailers be sold in lots of five or more so dealers can buy and resell them. Both groups said that selling directly to consumers could pose safety hazards if adequate training is not provided. FEMA is working with the General Services Administration, the federal government's real estate arm, to auction trailers in batches of about 300 at a time "so we do not flood the market or harm business," FEMA spokeswoman Deborah Wing said. Beyond the issue of cost, critics have also raised health concerns about the trailers. Becky Gillette, spokeswoman for the Sierra Club of Mississippi, warned that wood and glue in new trailers have released formaldehyde gas at levels that have irritated occupants' eyes and lungs, posing a health risk. On a more positive note, TreeHugger has a post on 'The Green Project': New Orleans Salvaging Building Materials. Rebuilding New Orleans in a economical and environmentally sustainable way has been discussed on TreeHugger before, here, here, here and here. The Green Project is a sustainable local New Orleans initiative that salvages building materials and sells it on cheaply to those who are rebuilding their homes. By deconstructing by hand rather than demolishing buildings, they are able to conserve valuable resources and keep recovered materials out of landfills. The salvaged materials are then recycled into new building materials, many of which are irreplaceable such as architectural elements, hardware, and old growth lumber, these are then used to repair and rebuild damaged homes. Another place that is in dire need of affordable green housing seems to be the trailer parks of California. Like most of their neighbors in the sprawling, ramshackle Oasis Mobile Home Park, the Aguilars have no heat, no hot water. On cold nights, the family of eight stays warm by bundling up in layers of sweaters and sleeps packed together in two tiny rooms. Bathing is a luxury that requires using valuable propane to boil gallons of water. So the farmworker clan spends a lot of time dirty. Jose Aguilar, a wiry 9-year-old, has found a way around the bath problem. He just waits until dinner. “My mom makes frijoles,” he said, “then I take a bath in that water.” Jose and his family live in a world few ever see, a vast poverty born in hundreds of trailer parks strung like a shabby necklace across the eastern Coachella Valley. Riverside County officials say there are between 100 and 200 illegal trailer parks in the valley, but the Coachella Valley Housing Coalition says the number could be as high as 500. California Rural Legal Assistance says as few as 20 parks are legal, and they are often as dilapidated as the illegal ones. When county inspectors locate a park without permits, they prefer to let owners bring the place into compliance through loan and grant programs rather than evict the tenants. Some of the largest and poorest parks are on the Torres Martinez Indian Reservation where they are not subject to local zoning laws and the county can’t monitor safety, hygiene and building standards. The reservation is also home to the worst illegal dumps of any tribe in California, Arizona or Nevada, according to the Environmental Protection Agency. The federal agency has closed 10 of the 20 most toxic dumps and cited four of the largest trailer parks for health violations. Exactly how many people live in the trailer parks is unknown, but social workers estimate tens of thousands. The biggest park, Desert Mobile Home Park, or “Duroville,” has more than 4,000 residents and can be seen off California 195 near Thermal. Others are on private property and virtually invisible to passing motorists. The tenants are almost entirely Latino farm or construction workers. Many are in the United States legally, but plenty are not. Their average income, according to county officials, is about $10,000 a year. Many parents rent out their children’s rooms for extra money, leaving kids to sleep on floors or in sheds. Many families keep warm by burning grape stakes, which fill their trailers with toxic fumes. A few more related posts (no commentary or quotes as I'm running out of time tonight) - About My Planet on recycling construction waste, a roundup of articles on green roofs from Energy Bulletin, Jeff Vail on his suburban solar retrofit, a note for locals that the 2nd Australian International Green Build & Renewable Energy Exhibition and Conference is on in June (free tickets), and a lecture from Bill McDonough on Cradle to Cradle Design. I'll close with a WorldChanging post on The Greenest Building. Believe it or not this whole post was originally just a subsection of another one I'm writing, however it got so out of hand that I had to split it up - hopefully the rest will appear tomorrow and the linkage will be apparent (to anyone who actually manages to read these monstrosities from start to finish anyway). Two weeks ago I visited the Alberici corporate headquarters, better known as the greenest building in the world. It was nothing short of inspiring. I was at once overjoyed and envious -- overjoyed because of the superlative commitment this represents, and envious because I wanted to work in such an amazing building. At the time of this writing, the construction firm's St. Louis, Missouri main office building boasts the highest LEED (Leadership in Energy and Environmental Design) rating ever awarded by the US Green Building Council: 60 points out of a possible 69. Under the USGBC's LEED program, points are awarded for fulfilling certain sustainable building techniques, such as using efficient ventilation systems or recycling construction waste. As an example of just how formidable Alberici's LEED platinum rating is, consider this: basic LEED certification requires just 26 points. The phrase "above and beyond" doesn't begin to describe the extent of Alberici's commitment to going green. During my visit, I was curious to learn how those coveted 60 points manifest themselves in the building's daily operations. Would the changes be dramatic or subtle? A smart investment or a financial sink? The first thing Alberici visitors notice is the massive wind turbine that graces the 13.86-acre site. It's clearly visible from the highway, rising on a thick white stalk just off the interstate. The turbine itself is actually pre-owned; it's a leftover 65-kilowatt turbine from a California wind farm. Under normal use, the turbine generates about 18% of the 110,000 square foot building's power, which is about equivalent to powering all the electric lights in the facility. That 18% generation capacity is by design rather than the limits of technology. If the building generated any more electricity, batteries would be necessary to contain the leftovers, or additional technology would be required to sell the extra kilowatts back to the St. Louis grid. As it is, the turbine generates just the right amount of power for the building's daily use. The building itself was converted from a 50-year-old manufacturing building. Because Alberici didn't need the entire building immediately for office space, they were able to get creative with the structure. Fully half of the original building was given over to a tiered parking garage, and a 70-foot bay in the center of the facility was modified into an open-air driveway landscaped with native plants and grasses. Both of these modifications have the potential to be converted back to office space if Alberici outgrows their space. When designing the redevelopment, Alberici limited the amount of asphalt used in the landscaping, thereby reducing the heat island effect that plagues so many urban areas. On the roof, a rainwater collection system filters the water and uses it to flush the building's toilets and urinals. Retention ponds nearby pool the site's stormwater, preventing it from overloading St. Louis' archaic sewer system. Solar thermal panels provide about 90 of the building's hot water needs. According to publications on the building, the Department of Energy certified the Alberici headquarters as 60 percent more energy efficient than a conventional building. The interior is no less impressive. Because the building was originally designed as a gigantic industrial factory, Alberici's designers had to create a mezzanine level to provide two functional floors for offices and workspace. And again, sustainable solutions are easy to spot. Rapidly renewable resources (bamboo, cork, soy, etc) were used whenever possible for interior finishes, desks, bars and bulletin boards. Natural day lighting is an important at the Alberici headquarters; every employee has access to sunlight, and research has shown this goes a long way toward improving morale and employee retention. A carbon dioxide monitoring system automatically keeps tabs on the building's air quality, periodically introducing fresh air from outside when necessary. During the summer, employees are encouraged to open the building's windows and create a refreshing cross breeze. Wandering Alberici's halls, I was struck by the overall synergy of the building. The air smelled great, artificial lighting was diffuse and minimal -- even the cafeteria offered organic fare. The entire project was a series of small, sensible decisions made to gently lessen the building's environmental impact, and the end product is an uplifting example of worldchanging at its best. I think prefab housing could have a great effect on housing epidemics in low income areas. Strand Homes - Mesa manufactured homes at great prices! If you want to build a 'green' house you need to find a green-minded architect and a budget closer to $600K. Add another $100K if you have a sloping or awkward shaped block. There are a few green kit/project homes around but they can't compete with the scale and efficiency of the McMansion building industry. Who can blame a typical Aussie family for building a McMansion. You get so much more house and they are so much cheaper. Whack on a cheap AC unit and it doesn't matter how hot or cold the site gets you'll always be comfy. I've been in the Industry 18 years and have had my own Building company but am now freelancing to Builders. On behalf of one Builder I'm dealing with 5 clients with budgets between $1M - $3.5M and I tell they don't want to pay for "Green" even with those budgets. They do want enviro-friendly houses, and they want to tell there friends how green they are, as long as they can afford $50K smart wire (a very expensive radio in every room is what they get like 15 years ago) $210K (i just got the quote) for kitchen cupboards and it doesn't effect the Re-sale value. ie it must comform to the Similacra. I bring up grey water diversion, rainwater collection, double glazing and then have to check that the transformer in their street has the capacity to run all their lights and air-cond. (and sometimes it doesn't) it's all very dissapointing. The rich will never care for the planet--even if it is in their own interest. They are self-absorbed. Best to concentrate on the expectation that pragmatically a social movement to "green" the working poor's homes (and remove urban and rural codes difficulties in doing it) is a workable goal: they are the ones who will really benefit economically from small percentages of energy efficiency savings as it is a larger portion of a smaller annual income, as well as benefit from wider energy independence. How about a post on the massive world-wide housing bubbles (see wikipedia) and the associated environmental impacts? Suburban homes for LA workers being built on agricultural land in Bakersfield a 1.5-2 hour commute is one example. If humans cannot become aware of speculative bubbles and stop them, there is very little hope that humans can recognize creeping environmental degradation and do something on a grand enough scale to prevent it. I would be interested to see a green blogger tackle this cross-cutting issue. This coming from a financially concerned/literate part of the sustainability choir. I have a degree in sustainability and work in large scale energy efficiency. The subject of how to make green housing attractive and financially competitive is an interesting one and one I don't have any glib answer for unfortunately. I think carbon taxes could go some way towards making people think about the energy inefficiency of McMansion design - but I doubt it would be enough to sway a significant portion of people. Most architects seem to be keen on the sustainability goal but its the mass-market home building companies who are in need of some serious Viridian brain-washing. Anon (2) - I think the rich by and large are just as likely to care about green building as anyone else - and at this point are more likely to actually pay for green buildings. But I will agree that its the mass market (both poor and middle class) where the big gains are to be made. Sunset Beach dude - Suburbia and the housing bubble is a topic which has been given a fairly thorough going over by the peak oil world (Mr Kunstler and many of his acolytes, for example) - I'm not sure I have a huge amount to add to the conversation on that one, other than to note that modern suburban sprawl is an environmental atrocity and the housing price bubble was one of the things that made me into the cranky blogger I am today. Whats done is done though - the boom is turning into a bust in some places now and has flattened out elsewhere. Inflation will eat prices back down to historical averages over time. The real issue is how to retrofit suburbia to make it more sustainable. I might note that a new speculative bubble - in cleantech - may actually be a good thing - what we want is (1) lots of innovation, (2) oversupply of product to bring prices way down and (3) lots of deployed capital with politically active owners seeking to encourage the system to protect and grow the value of their investments. Overall, I am aware of and agree on all your points. The housing bubble has made me cranky as well. However, without an explicit acknowledgement of the mal-investment caused by the housing bubble we might continue to make big picture mal-investment due to the distortions in the marketplace. No worries - and I'm not trying to ignore the housing boom or the problems McMansion sprawl poses. I used to note them both but the topics eventually drifted off my radar as I found I had nothing new to say on them - it was just an obvious car wreck waiting to happen. Mal-investments are part and parcel of capitalism and investing unfortunately (and any other economic system for that matter) - very hard to avoid unless you are omniscient (and all-powerful). We will be designing our ultimate green house this year. We live in the greenest shire in the country, we have a green mayor, a green council, and dozens of green architects and builders to choose from. Despite this I reckon the approval process will be difficult, and it will be horrendously expensive to design and build. We are budgeting $200K over what a 'standard' house for the same block would cost. 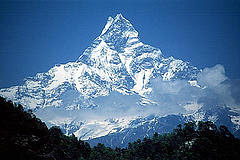 We'd like to achieve zero net energy and water use, with solar hotwater, solar PV and big water tanks ... I draw the line at worm toilets though! It means we'll have to forego the marble benchtops flown in from Italy, the integrated wall hung toilet bowl, and the 3000L room-sized bathtub, but so be it. I'm glad you are willing to suffer for what you believe in Dave ! The momentum is growing for elevation of awareness of green homes for sale nationally and globally. Listed Green is continuing to grow with the demand for developers of green projects to "get the word out", about their energy efficient communities that are currently or soon to be announced. Listed Green has also been asked to present itself at AltBuildExpo 2007 in Santa Monica on May 18th and 19th 2007. Listed Green is excited to be part of this 4th annual event. Like-minded folks can now offer green homes for sale for only $20 per month and green home builders can do the same. We look forward to getting the word out, as we're sure the green, sustainable housing marketplace is ready for us. "The real issue is how to retrofit suburbia to make it more sustainable." Suburbia? That is a very limited "First World" sort of statement. When about half of the world population are going to be living in slums within 40 years or so, the goal should be working toward making ecoregional autonomy, decentralization, and sustainable building a more integrated project. Suburbia? That is a very limited "First World" sort of statement. Errr - dude - did you read the whole post ? There's a whole lot of stuff about "dark green" building which is applicable the non-first world. In the quote you use I was responding to a comment about what a waste of resources building suburbia was - simply noting that whats done is done and it needs to be fixed as best it can. Thanks for the link though - I've quoted Wade Davis a number of times and he's one of my favourite authors. I agree with the prefab housing. And I disagree with the rich not caring for the planet. Sloan Barnett, author of "Green Goes with Everything" is a hot top seller that is being highly promoted by many celebs. Middle class, green families like mine are enjoying her new book as well, along with her Body Burden Test.